No I didn’t get the new Juki I’ve had my eye on, however, I do feel incredibly blessed to have good friends and family to share my birthday with. I was able to spend the weekend celebrating my special day, which I share with my lovely Grandma who is now 96, with lots of food, drink, hugs and birthday cake…. but no quilting!! We need to travel a couple of hours away to celebrate big family events like this so it forces me to take a break from quilting. Of course I brought along my knitting though! I’m working on new Spring/Summer weight Honey Cowl! Anyway, as today is my actual birthday, it feels a bit anticlimactic…. just the way I like it, no fuss, just a lovely morning hike with a dear friend and then back to my machine for some more quilting! I was going to go with concentric circles on this baby, then decided at the last minute to quilt these flowy organic vertical lines. My hope is that they will really allow the design and composition of the quilt to really shine. It depends on the quilt to me, but I think sometimes the circles can become the dominant part of the overall quilt, which in this case, with all the negative space and such a specific design, I did not want! 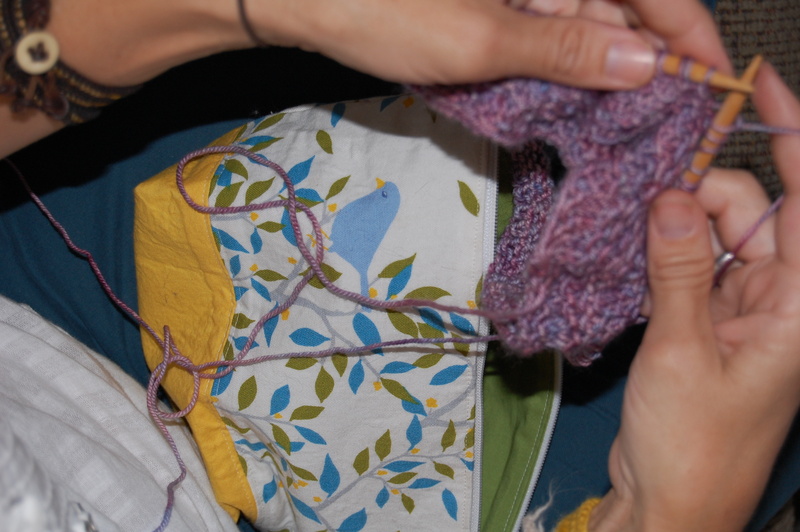 I’m using Aurafil in Linen…. and on linen, and loving how it really blends right into the fabric. Wheww, just what I hoped for. I can’t wait to see these lines finished and get this one bound!! Love it! Can’t wait to see it whole. My next is going to have organic straight lines too I think. 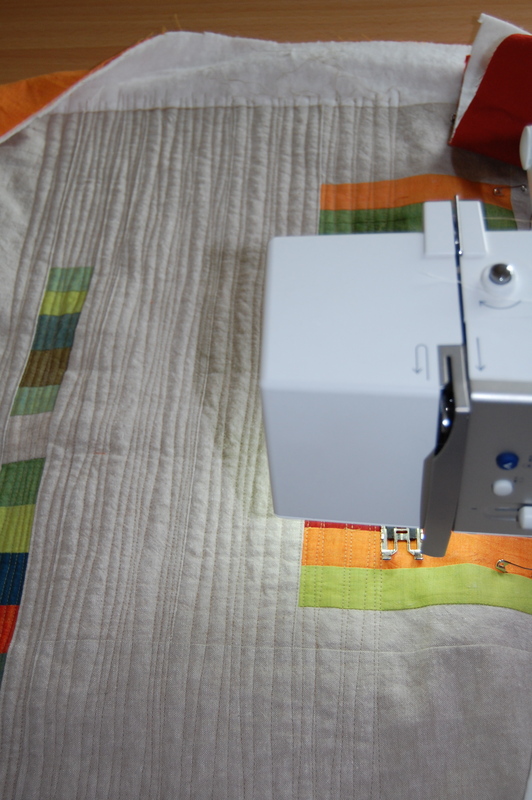 you are absolutely right about concentric circle quilting. i think your decision to go with the lines is a good one. happy birthday!! Love the flowy line you made! Happy Birthday! Your quilt looks beautiful! Happy Birthday! My grandson’s birthday is today, he is 1 year old! Happy birthday Karen! 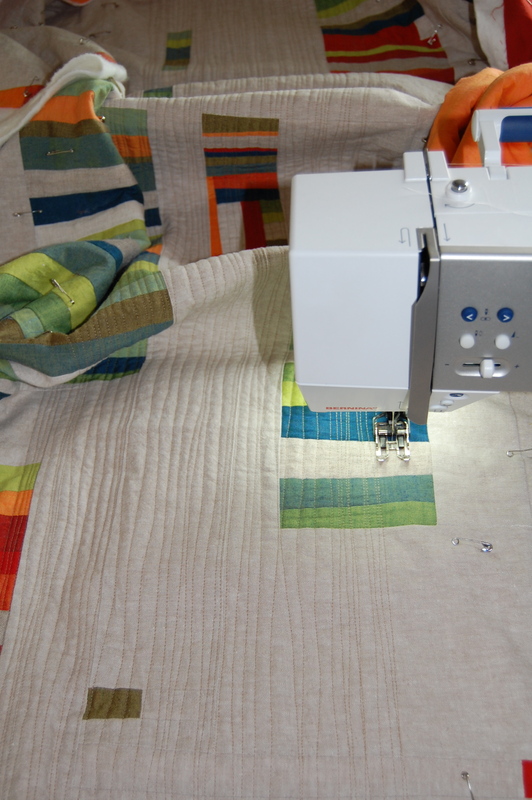 loving watching this new quilt come together. lovely quilting. perfect quilting design for this top! I can’t wait to see it all finished. Happy birthday! Wishing you a happy birthday and lots and lots of time to make beautiful quilts! happy birthday… those lines are fabulous!!! Oh, I’m a little late ~ Happy Birthday Karen. 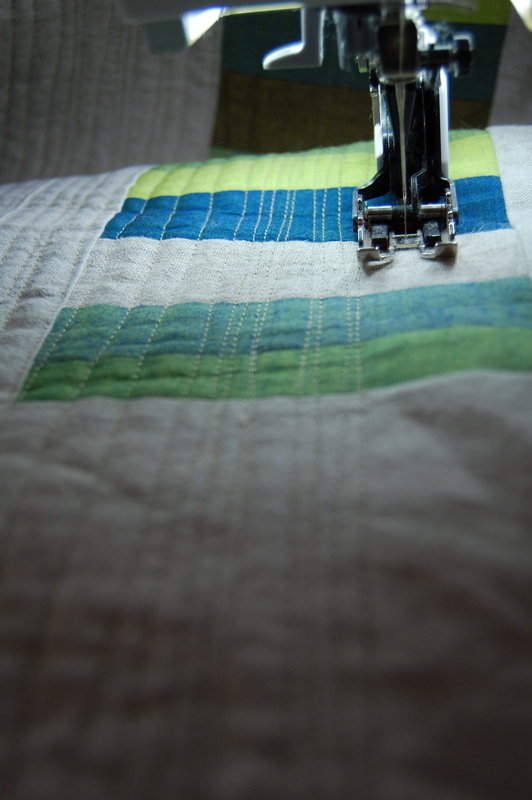 Love the quilting ~ I’m a line kind of girl ~ it’s my favorite to do, straight or wonky. Happy belated birthday! And I love those organic lines, they’re perfect with the fabrics and the design. Can’t wait to see it all finished!